Who doesn’t like the high revving feel and agility of a race bike? Riding these lean-on motorcycles every day though can be challenging for the body. Is it possible to get a similar performance from a bike that offers a comfortable riding posture as well? Triumph Motorcycles has cracked the code with its new 2017 Street Triplethat claims a position among the best middleweight streetfighters. The only version of the bike that has been launched in India is the ‘Street Triple S’. Read on to find out if it fulfills what it promises. 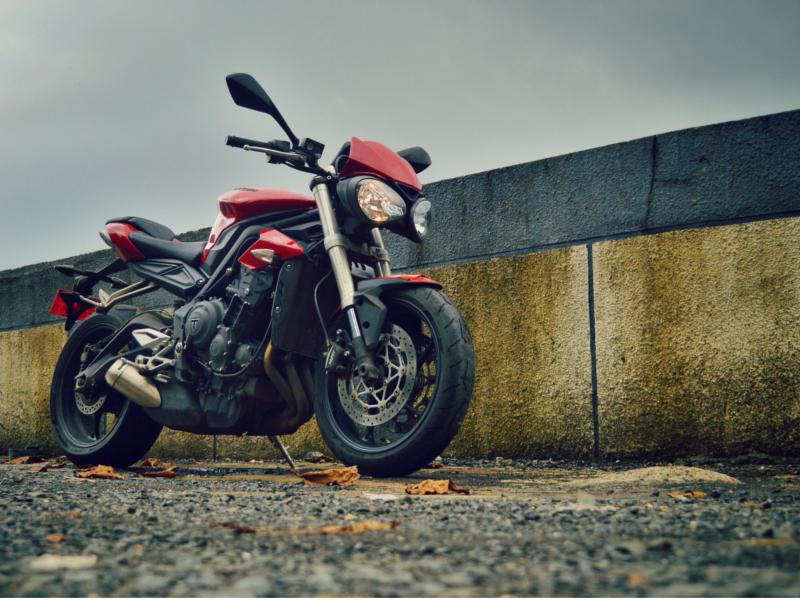 At first glance, the new Triumph Street Triple appears almost identical to its predecessor. However, a closer look reveals differences in detailings. The most catchy change in the motorcycle is the revised shape of its twin headlamp setup — shared with the bigger Speed Triple — that looks much better than the previous generation. Moreover, the new visor and the air intake mounted between the headlamp setup makes it sportier. While the styling may take ‘some getting used to’, but it looks unmistakably dominating and purposeful. 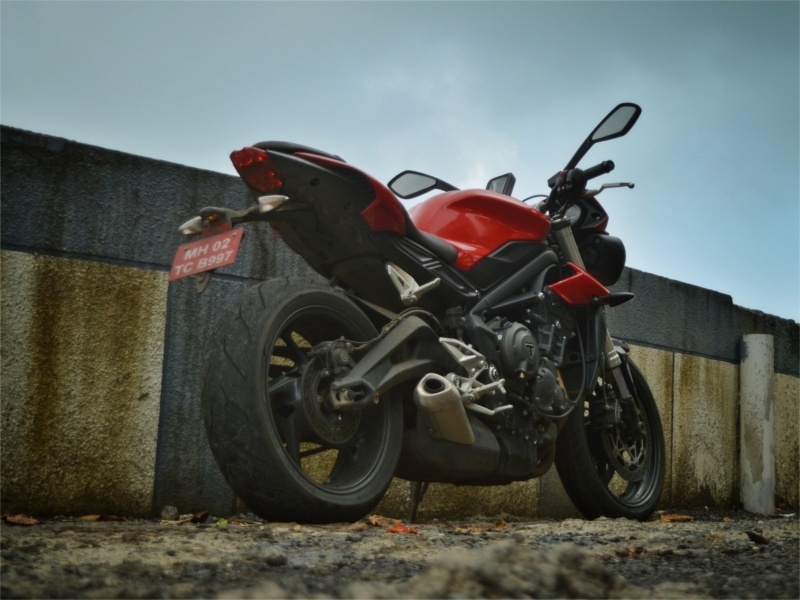 The main perimeter frame of the bike – which is made out of race-spec alloy – remains unchanged while slight changes in the rear subframe are clearly visual. The masculine fuel tank of the bike also remains untouched while the smaller tank shrouds are new. The tail section of the 2017 Street Triple looks all-new with sleeker and sharper panels, and a split type seat. The shorter exhaust pipe enhances the minimalistic appeal. Another positive change is the new gullwing swing-arm while the alloys have been retained from the predecessor as they were already perfect for the design. The new model definitely looks more premium and does turn more heads than the older version. However, it still misses that drama in styling that its Japanese and Italian rivals express. The 2017 Triumph Street Triple gets a new, bigger 765cc engine that replaces the old 675cc mill. It is the same high-revving inline-three motor that is supplied for the Moto2 bikes in MotoGP – with a few alterations, and is also expected to power the next-gen Daytona. 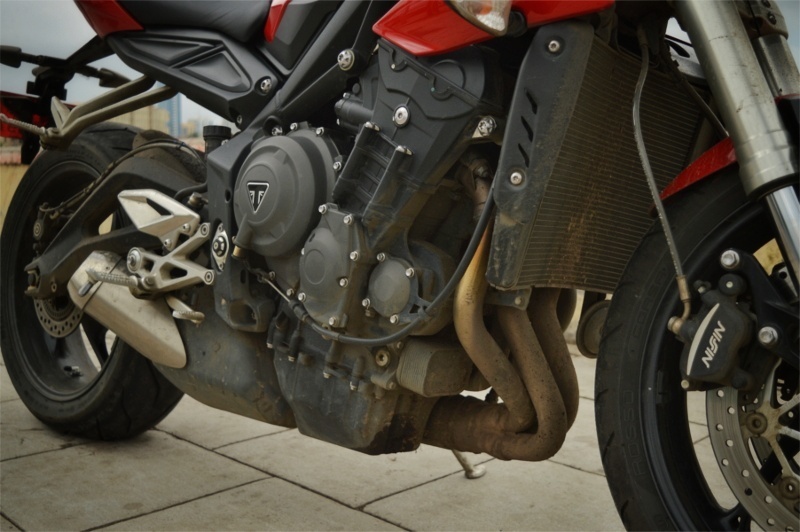 In the Street Triple S version, the motor has been tuned to deliver 113PS at 11,500rpm and 73Nm of torque at 9,100rpm. Besides the numbers, the real world performance of the bike is also impressive and way better than its predecessor. 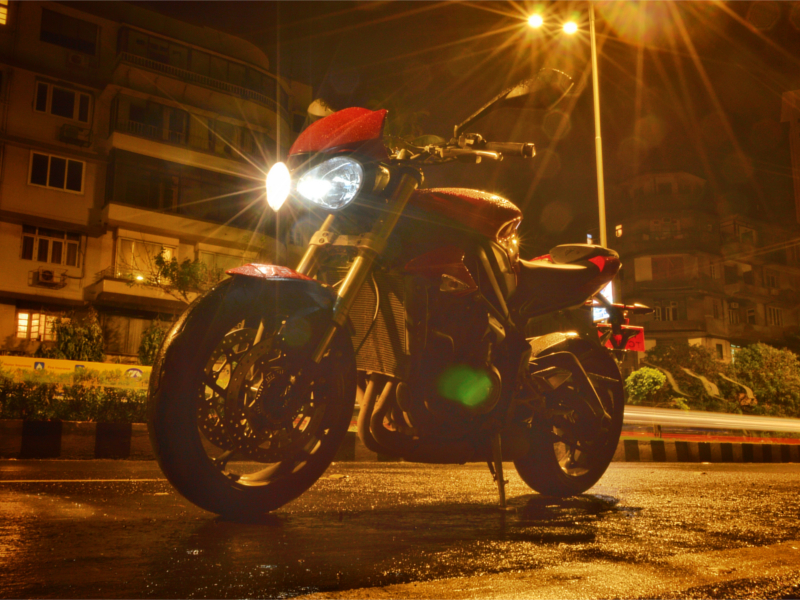 Every twist on the throttle gives the same feeling that comes from a middleweight race machine. Also, the new Euro4 can screams louder thanks to the new airbox. 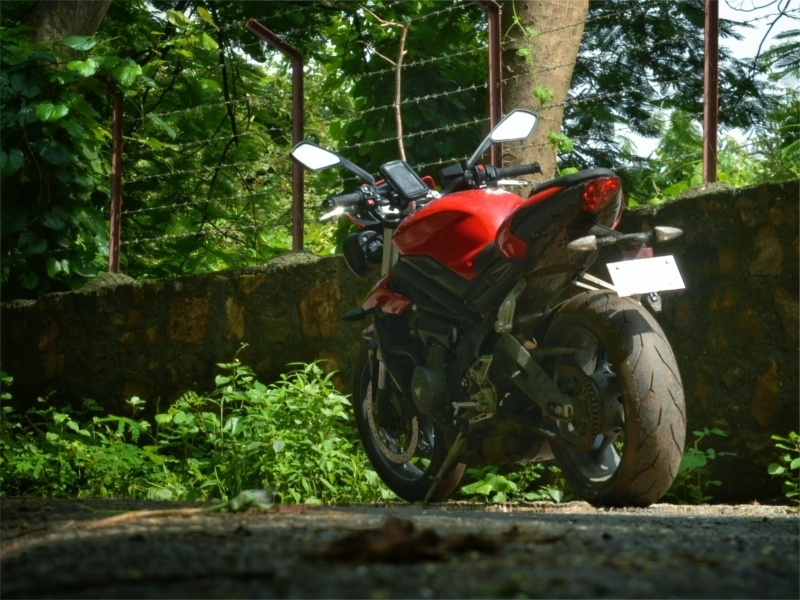 The exhaust note is so mesmerizing that one can hardly resist throttling even when the bike is idle at traffic signals. The engine feels quite refined and the power delivery is almost linear across the rev range. The mid-range delivery impresses but the winning part comes after that. The six-speed gearbox also offers shorter ratios like a track bike, especially in the first and the second gear. Moreover, a dry weight of 166kg makes it one of the lightest motorcycles in its category. 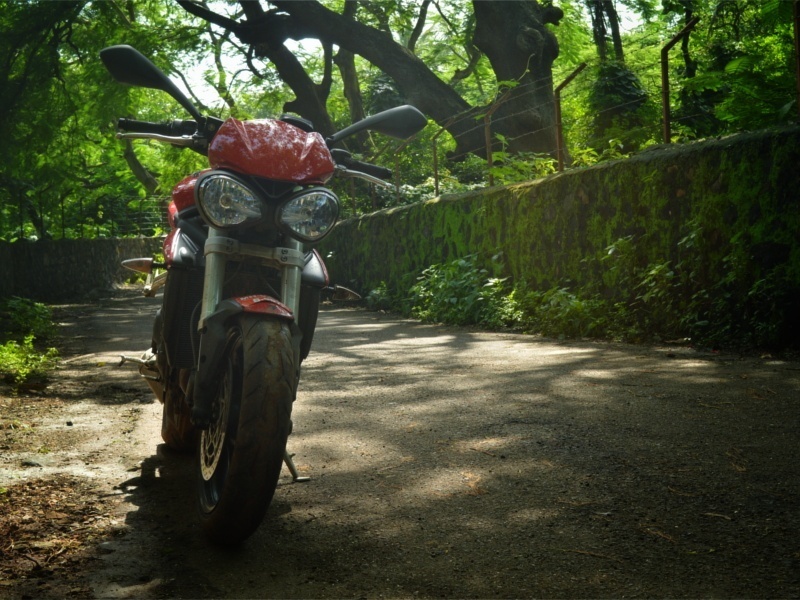 All of these make the bike really quick and capable of doing a 0-100kmph sprint in less than 4 seconds. One doesn’t have to put much effort to cross 180kmph as well and Triumph further claims a top speed of 220kmph which seems quite close to the reality. There is no major heating problem on open roads but one can feel a little extra warmth on the right leg while riding the bike in traffic conditions. The engine is definitely one of the most impressive features of the 2017 Street Triple S.
Any change in comfort and convenience? 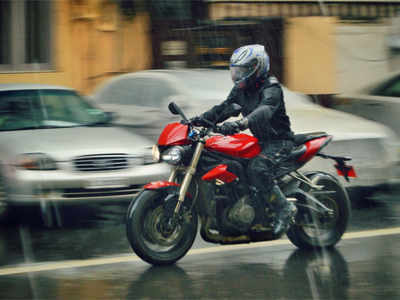 The previous generation Street Triple was one of the most comfortable motorcycles in its segment. This increased expectations from the new one. Looking at the spec sheet, the seat height of the new model has been increased by 10mm at 810mm, which seems like it could be a problem for short riders. However, it actually is not. The new split seat design helps the rider to reach the ground comfortably. On the other hand, one has to compromise with the comfy padding that was better in the predecessor, especially for the pillion part. The seating position has been improved while the placement of foot pegs remain on the sportier side. 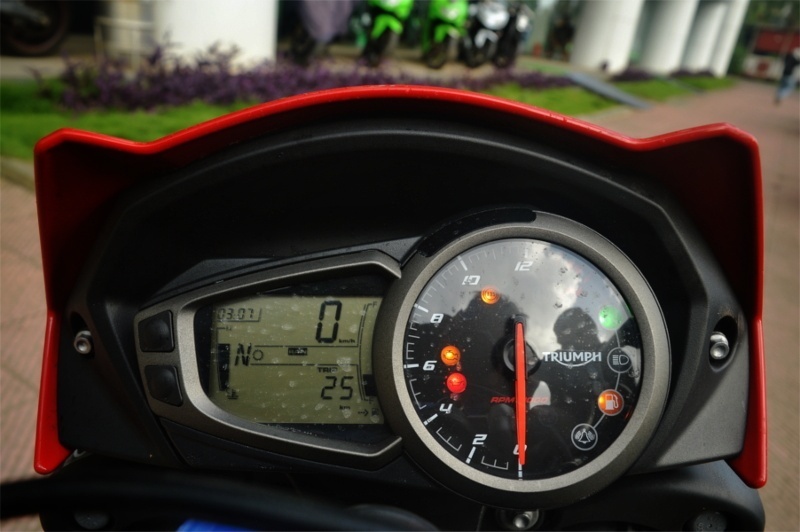 The instrument cluster has been borrowed from the Speed Triple and looks slightly better than the previous one. It’s easy to read and has a comprehensive info list. The new model was also expected to get a more convenient handlebar mounted scroll button to access the functions and toggle between the display information like is seen on the new modern classic series. However, Triumph has carried the same dash mounted buttons from the older version. Triumph has replaced the KYB shocks with Showa setup in the new model. The bike now features 41mm separate function inverted forks at the front and a preload adjustable monoshock with a piggyback reservoir at the rear. The setup provides an optimum ride experience and one can hardly feel minor undulations of the road. However, the extremely low ground clearance of just 130mm can shock you, letting the bottom of the bike be abused by speed breakers. So, the advice is to go as slow as you can on the humps and deep pot holes. The wheels come shod with sticky Pirelli Diablo Rosso II tyres which hold the grip at any speed, in every corner. The new gullwing swingarm with a higher bend, reduces the length, further providing better agility. However, the not-too-stiff suspension tuning doesn’t allow those quick transactions to lean in the corners which one can do on a supersport motorcycle. On the other hand, traction control is switchable but not independent of the riding modes which are ‘Road’ and ‘Rain.’ So, the rider has to disable the function if the setting doesn’t match with his/her requirements. The slipper clutch is a big miss on the S version — which is available on the higher trims — as the shifting takes a bit extra of efforts from the rider. Moreover, the lever pull is also not that light but the adjustable feature compensates for that. The lightweight design and well manageable power make the 2017 Triumph Street Triple 765 a good middleweight option for the novice as well as experienced riders. Moreover, it is well packed with a decent electronic package that further enhances its friendly nature. 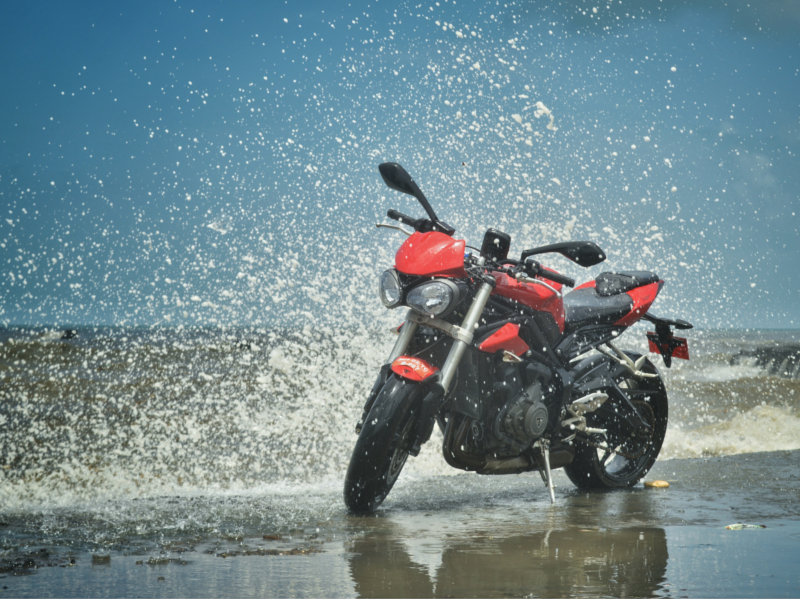 It is a big bike that is surprisingly manageable in varying conditions, except off-roading. It is that one bike which can be used on streets, highways and even can be taken on the track days. So, if one wants to put money on just one middleweight motorcycle, the new Street Triple can give a good run for the bucks. So, how much does it cost? 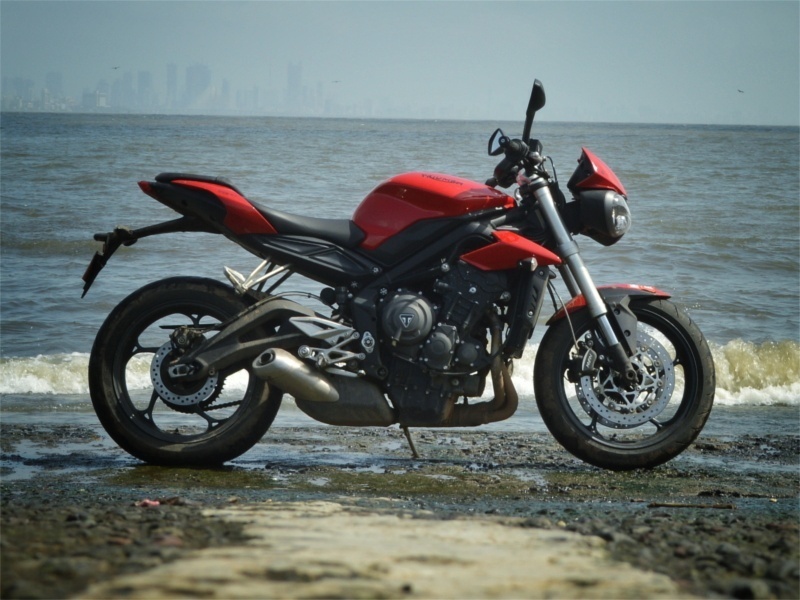 The Triumph Street Triple S comes with an ex-showroom price tag of Rs 8.71 lakh. The bike definitely doesn’t sound very affordable, especially when its closest rival — the Kawasaki Z900 — starts at just Rs 7.68 lakh (cheaper by a lakh). Moreover, the Japanese offer a more exciting styling with adjustable front forks, an extra cylinder, more power and more peak torque at relatively lower rev-range. 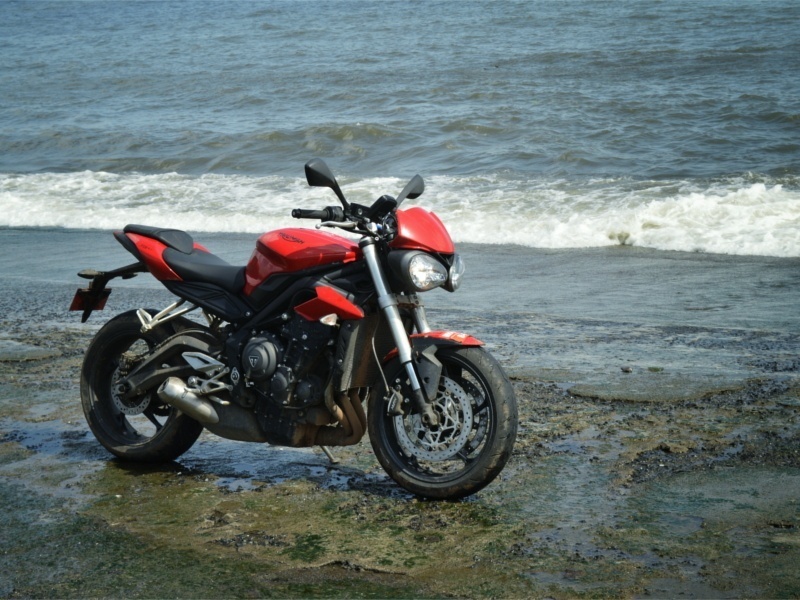 However, the lighter design provides the Street Triple S with a better power-to-weight ratio against the Z900. 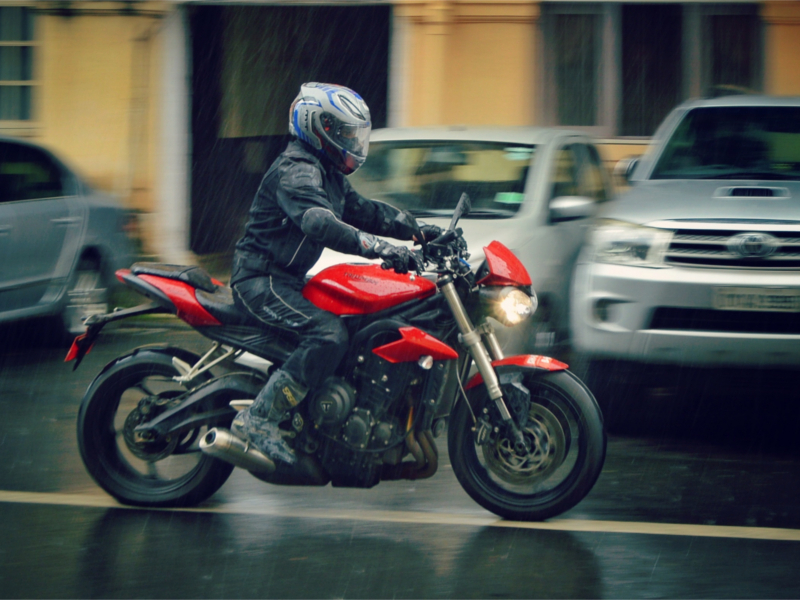 Also, the Z900 misses a better electronic package which includes traction control, much better braking, friendly characteristics and road manner over the Street Triple S. And all this makes the British a better well-round package – especially for buyers without the price as a primary concern.